How to describe the feeling when chamber doors opened and Brian David Mitchell walked in in handcuffs, singing religious hymns. First, just the sight of him made my skin crawl. He is little, squirrly,greasy, vacant. He's got the Manson vibe, with longer hair. I thought my heart was going to beat out of my chest. The courtroom was silent except for his haunting tunes. I kept wondering how is he allowed to do this? But then again, this is the same person who allegedly broke into Elizabeth Smart's bedroom, stole her and then kept her for nine months, assaulting and abusing her. When the judge finally said that Mitchell needed to leave and watch proceedings on closed-circuit television from another room I was able to breathe easy. Or at least easier. I just read in the local paper that the lead prosecutor spent time in Bosnia-Herzegovina assisting with criminal prosecutions, and also assisted in the prosecution of Saddam Hussein. His team of lawyers seems whip smart, eager and ready for the case. The defense team, in my humble opinion, seems flustered, bumbling, desperate. Much to my surprise, the two sides seem friendly and often talk with each other at the breaks. I guess I don't know enough about how these things work. I found the judge, who looks a bit like Alfred Hitchcock, to be personable, funny and very, very smart. There are a lot of personalities in that room, even more when you add the perspective jurors. The court interviewed seventeen jurors today, retaining nine of them. Apparently they need thirty before they can choose the final twelve plus alternates. It might end up being jury selection all week, and if that's the case, I might need to come back at a later date to see some of the testimony. Who knows how it will all shake out. I suppose there's a chance that it could start Thursday or Friday. I feel funny writing about this while it is just happening, so I think I might lay off the blogging until the end of the case. Also, it's a lot to digest, and I think I may need to take it all in first. On an entirely different note, I am thoroughly enjoying my hotel's happy hour, replete with generous portions of wine, free massages and very interesting people. Utah is beautiful and there is already snow on some of the mountains. This is definitely a surreal trip, but I've already gained so much knowledge. Tomorrow is election day. Good luck to us all! Wow! Sounds so creepy!! I have to remember to read your blog way before I go to sleep!! 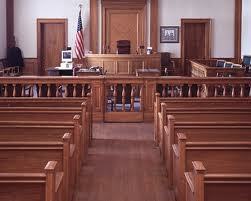 Is that photo of the actual courtroom you're in? Miss you!